A few times a month, I have a patient, usually a young child, who presents with an earring that not only can not be removed, but is embedded within the earlobe (or ear) itself. There are two common scenarios that lead to this unfortunate situation: infection and fiddling. Infection is fairly straightforward. For whatever reason, the piercing gets infected and the earlobe skin starts to swell around and eventually even enveloping the earring itself. To prevent an embedded earring, immediately remove the earring!!! If you wait until the swelling is too severe, it may not be possible to remove the earring at all without surgical intervention. 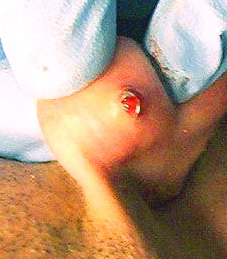 This type of infection can occur rapidly from being normal to rip-roaring infected swelling within 24 hours. Fiddling is basically when the patient keeps tightening the earring backing snug with the skin as tightly as possible so the earring won't loosen and potentially get lost. However, such tightening can actually induce the skin to overgrow the earring with subsequent infection. To prevent this from happening, always make sure there is some “play” that allows the earring to push back and forth through the ear and turn easily. Now, should the earring become embedded and manual removal not possible, surgical intervention is required. 1) Sterilize the area with betadine. 2) Inject area with lidocaine. 3) After the area becomes anesthetized, a scalpel is used to create an "X" shaped incision over the embedded earring. 4) Toothed forceps and clamps are used to grab and pull the embedded earring out. Aftercare typically involves oral antibiotics and application of antibiotic ointment several times a day. Once the infection clears, I typically recommend waiting a few months before re-piercing to allow scar activity to completely fade first. Also, keep in mind that they DO make earrings that are physically impossible to tighten up against the skin to reduce the possibility of embedded earrings. On that note, we do offer ear-piercing in our office. I kind of wish I knew about how bad tight earrings get by reading this information years ago. My first earrings were too tight and infected. Skin grew over the back of the earrings, my earrings had to be ripped out by house pliers. I had to wait years until I got ears pierced again.